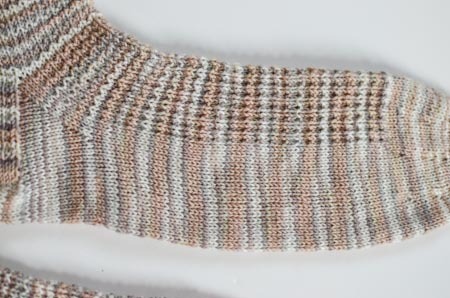 I think this stitch pattern is simple enough that both the variegation of the yarn and the sock pattern aren’t lost. Plus, it’s simple to remember and execute: *2 rounds of knits followed by 1 round of seed stitch, repeat from *. 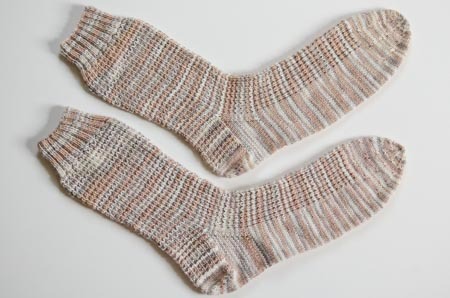 I’d be willing to try it on any variegated sock yarn as a first pass. Pattern: Gentleman’s Half Hose in Ringwood Pattern from Knitting Vintage Socks by Nancy Bush. Yarn: Lorna’s Laces Shepherd Sock, Aslan. Needles: US 0 dpns from my favorite Susan Bates Set . Going to give these beauties to my grandma! It’s been a while since she’s had a new pair of socks, almost one year! Plus it’s her birthday in just a few days! Variegated yarns can be so pretty, but also so trying if knitting anything remotely interesting. This stitch seems like a nice solution. Thanks! Very pretty! It does look great with the variegated yarn. A must try and will put in my queue – I have that book! Thanks for the link to the Baby Kina sweater; it’s really sweet. What a great idea to knit in the button holes on the Saartje booties as I really didn’t like the pattern way. Love this stitch on the socks. It really does look great with varigated yarn. Incidentally, I really, really like the way your Jaywalker pattern works with self-striping yarn! Thanks for a great pattern!! Your shawl is gorgeous, BTW….your other comments were closed, so that’s why this one is so long.